We are excited to announce that puppeteer, puppet designer and convention favourite Mary Turner will be appearing at Supercelebration in September! Mary worked on every puppet series from Supercar through to The Secret Service, and was responsible for sculpting Supermarionation stars such as Steve Zodiac, Troy Tempest, Captain Scarlet and Lady Penelope. 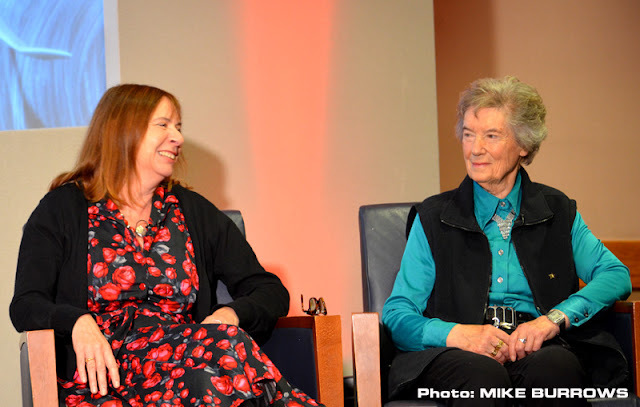 Mary has been a great supporter of Fanderson events over the years, and attended Special Assignment in 2017, where she appeared on stage alongside Judy Preece (pictured, right). Make sure you give her a warm welcome in Maidenhead, along with all of our other very special guests! This entry was posted in Events and tagged Mary Turner, Supercelebration by admin. Bookmark the permalink.